Do you want to launch agile business management ? Then, this book is for you. Top management’s job is to spot the waves of opportunity and lead the company in riding them. Visionary and strategic thinking is required to spot waves. Operational leadership leads the company in riding them. It’s like surfing big waves. To spot one is important, but success lies in riding it without falling off the surfboard. Your business is a living creature, a self-organizing and self-creating system. It comprises every element that supports in or hinders usfrom achieving our goals. It is much more than the company. All of the elements in its business ecosystem are part of the whole system. One: Set the right operational goals to establish the line on which you want to surf your wave. You only need one: contribution margin. Two: Plan. Build your surfboard. Design the right plan: Focus it on resolving constraints. Write it down on one single page. Three: Execute. Surf your wave. Follow the goal to deliver the obligations outlined in your operational plan. Four: Check. Review and adapt. Review progress against your goals and execution of your operational plan. Go back to planning if the operational plans need to be adjusted. Five: Lead. Add the value required from operational leaders. Lead your Plan-Execute-Check cycle to spin faster than your competitors. Institutionalize the culture of operational excellence. Surf the waves of opportunity. 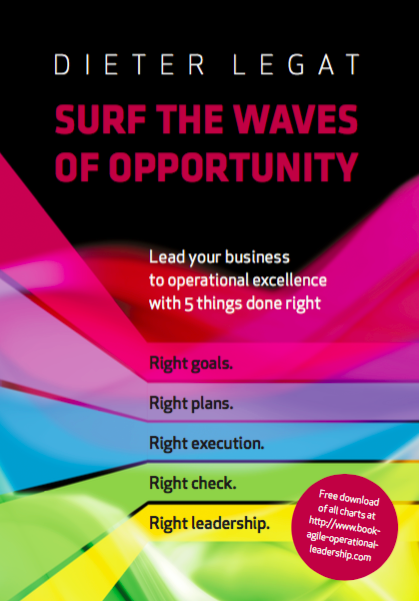 Operational leadership is all about surfing monster waves. It strains us to our limits. Yet it is the most fascinating and rewarding task in business management. You will likely become addicted, as I did. Shall we go? – Great, let’s go surfing. PS: You are welcome to download and use the book's charts free of charge for your own work and presentations. Working for AEG-Telefunken, Honeywell and Hewlett Packard, and since 2001 as consultant to top managers from start-ups to international concerns.